Hello 2017! Who else is excited for this new year and everything it may bring. Although we won’t know exactly what that will be, we do know when it comes to weddings there is sure to be lots of pretty things ahead. So for the first post of the year, I’m sharing ten of the hottest wedding theme trends for 2017, and I think you’re going to love them! When it comes to planning a wedding, I’m all for sticking with tradition, but I find it refreshing to do away with certain formalities and embrace a little bit of fun. From wedding gowns that are neither strapless nor skintight, to food that actually satisfies ‘ahem, your family’s favorite loaded mac and cheese’…2017’s wedding trends are carefree and sure to hit it big with engaged couples. But this new year isn’t just about letting loose, you’ll be seeing a lot more sentimental family touches, as well an elegance and sophistication of the past incorporated with rustic modern details. And thanks to Pantone’s choice for color of the year, plenty of beautiful greenery! Brides will make sleek, bold choices that are warm and romantic. Opposites will definitely attract and the mixing of sophistication and nature will strike a beautiful balance, we’re talking boho florals and rustic woods with modern details, like industrial lights and acrylic invites. Rustic details are becoming refined and curated with thoughtful details chosen specifically for each unique celebration. And metallics aren’t going away either. Instead 2017 will be filled with softer, more romantic shades like champagne, copper, bronze and of course rose gold. But copper looks to reign above all our favorite metallic hues. It has the ability to blend beautifully with glamorous, elegant, rustic and vintage nuptials. So be prepared to see it everywhere next year in the form of serving ware, embroidered lace, candle holders, Moscow Mule mugs and even copper wire boutonniere wraps. Couples are choosing to include more of their family heritage. Personal touches and ceremony elements that have been celebrated for generations will be included, as well as favorite family dishes. Think cozy, family style dinners that actually leave you feeling full and nostalgic. Dresses will have an even bigger nod to vintage, with lots of flowing lace. This will be the year to pull out your mother or grandmother’s dress and give it a breath of fresh air with your own unique personality. Hair will be simple and flowing, with loose pieces that drape down the neck and shoulders. Makeup will be on two ends of extremes – the nature lover will stick pastels and neutrals that highlight her natural features, while the other end will be glamorous like vintage Hollywood. With Pantone’s 2017 color of the year chosen as “Greenery”, it’s no surprise earth elements will a huge trend again this year. Be ready to see more use of plants and succulents for name cards, favors, and table runners. Garden weddings in 2017 will have an even stronger sense of green florals that will add more elegance and the beauty of nature to your big day. There will be an increased use of local flowers, foliage, eucalyptus, and naturally lots of lush greenery. 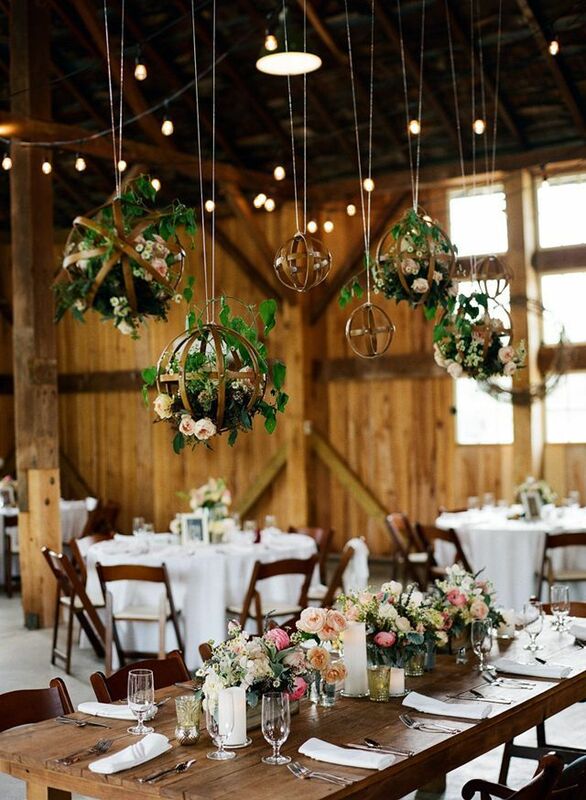 Couples are also thinking beyond just classic formal centerpieces, instead opting for a whole lot more rustic and minimalist inspired table garlands nestled with pretty magnolia leaves, fern and herbs. We’re also going to be seeing more props like hanging floral installations, as well as lighting patterns, and elaborate arbors and canopies. Classic muted color palettes are getting a pop of color with flower girl gowns, and bold rich bouquets, while bridal party dresses are steering in the direction of multiple hues, which include patterns too! And grooms are becoming a bit more adventurous with their suits by letting their fun personalities shine. If there is one wedding detail that has come a long way from tradition, it’s wedding bands. The traditional classic band with no stones has been replaced by the unexpected, with unique gems like yellow sapphires and black diamonds, new shapes and even stackable ultra-thin bands. And goodbye white gold, yellow gold is back! NEW YORK, NY – APRIL 15: A model walks the runway wearing the Mira Zwilliner Bridal Collection Spring 2017 on April 15, 2016 in New York City. When it comes to the dress, next year’s top trend will make you feel like a princess no matter your style. Right after 2017’s Spring Bridal fashion shows I couldn’t wait to share my favorite wedding gowns, because boy is this year going to be one beautiful one for brides, and the trend I love the most, embellished gowns! First there are the lovely necklines, and we’re talking everything from plunging to cape tops and even long sleeves. And while flowers may be few on tables, you’ll see them more on the bride’s gown with floral appliqués and elegant embroidery. Trains will be longer and dramatic, and the ball gown is making its way back to the top in a soft and modern way. Traditional registries featuring just one or two mainstream department stores are a thing of the past. Couples these days are opting for full fledged registries that allow them to choose a mix of out-of-the-box items they know they’ll actually use, along with traditional items. Registries like Zola allow loved ones to fund your honeymoon to an exotic destination like Thailand, or purchase that snorkeling excursion, or even donate to your favorite charity. And of course Grandma can still by you that KitchenAid mixer, but this time she can do it from Amazon. What are your predictions for 2017 weddings?